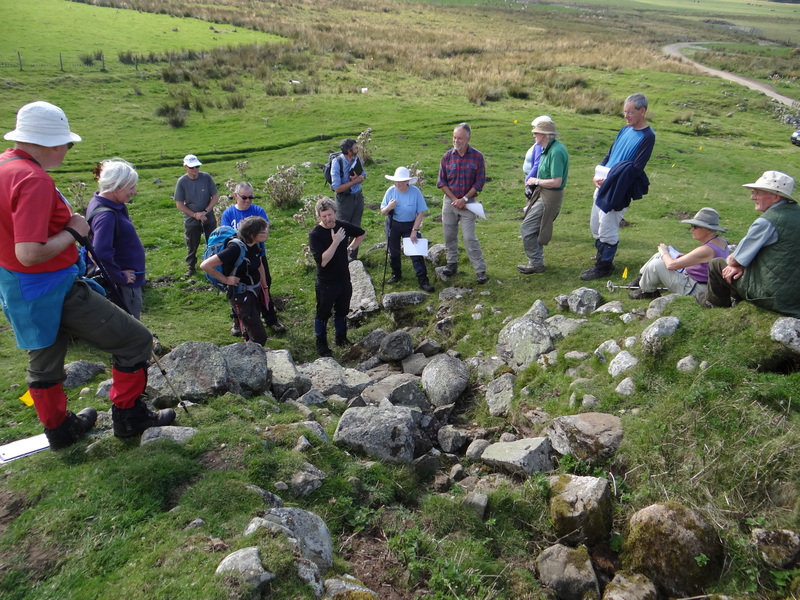 In September and October 2014 members of NOSAS working with archaeologists from RCAHMS, undertook a survey of the post medieval township at Banchor in Strathdearn. 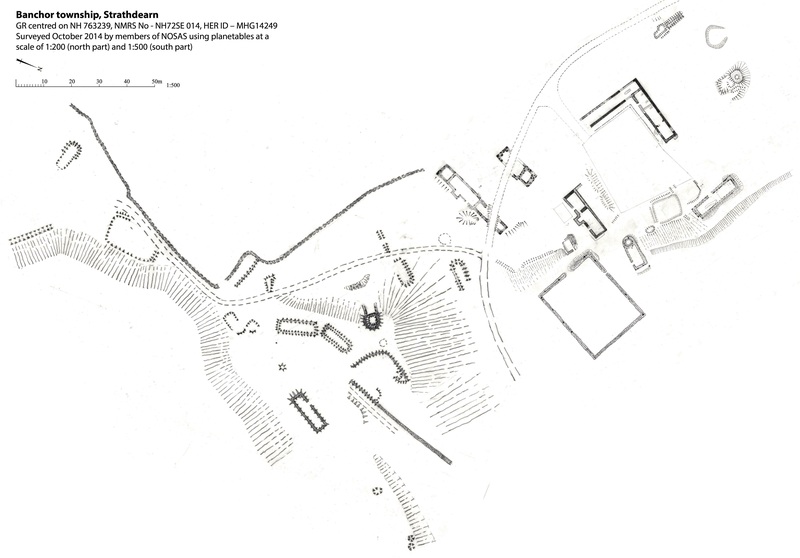 The buildings were plane tabled and the resulting site description and scale drawing can be seen below. The township of Banchor is on the south side of the River Findhorn 8kms SW of Tomatin. It was surveyed using planetables by members of NOSAS as part of a training exercise on 13th Sept and 24th Oct 2014; the north part of the site at a scale of 1:200 and the south part at 1:500. The township is bisected by a minor surfaced road and comprises at least 13 buildings, 2 corn drying kilns, a lime kiln and 4 enclosures; they appear to be divided into several phases although it is probable that there is some overlap. Early phase – The turf footings, sometimes barely discernible, of at least 6 buildings, possibly 7 and an enclosure are seen on the steep north facing ground to the south of the road. Also on this side of the road there are the stone and turf footings of a rectangular building with a rounded end, a stone walled enclosure and a lime kiln which almost certainly belong to a later phase. At least two more recent phases are represented by the stone footings of 6 buildings, 2 corn drying kilns, 2 enclosures and a possible sheep dip on the more level ground to the north of the road. Most recent phase – The main building has coursed rubble walls up to 1.5m high; there are two compartments, a small outshot in the south wall and evidence of several splayed windows. The L-shaped byre also has walls standing to eves’ height; but in addition there are several cruik slots here. This building has seen much alteration and reuse – it has evidence of a drain and a pit which was probably a sheep-dip. A terraced walkway with a stone edge is seen around the SE side. Middle phase – Three of the buildings on the north side of the road have stone footings only up to 0.5m and two of these had been bisected by the road. Two of the buildings have evidence of small outshots or “bed neuks” incorporated into their front walls, a feature which seems to be quite common in this area. One of the small buildings is recessed into the slope and was probably a store whilst one of the corn drying kilns which was more or less completely grassed over may have been of turf construction. 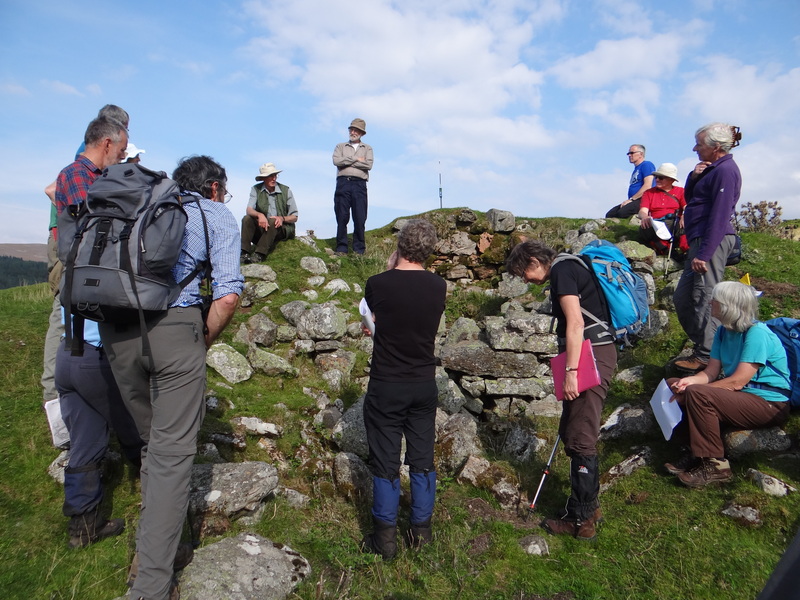 NOSAS members and archaeologists from RCAHMS consider a lime kiln at Banchor. 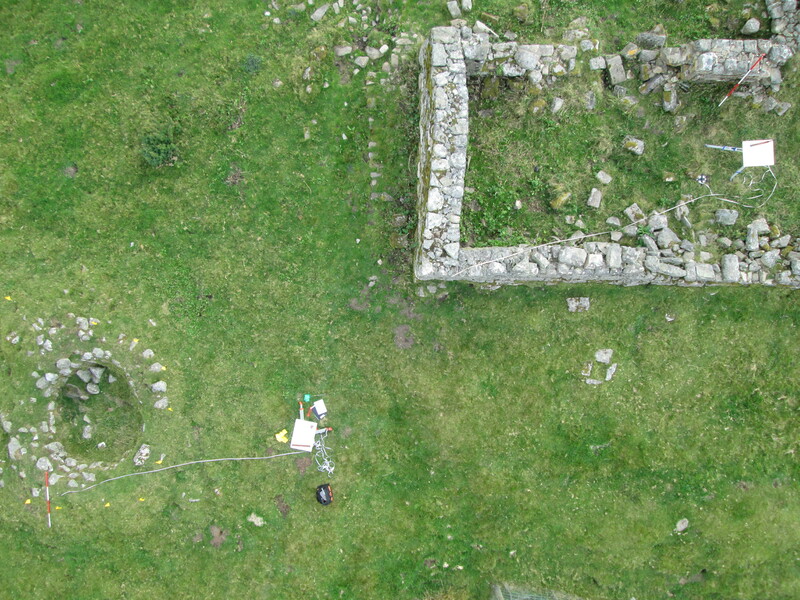 Further pictures and information about the Banchor survey can be found in our Quadcopter Blog Post.